One of my favorite garden flowers is the hydrangea. My bushes are lovely this year and also very surprising. My soil has turned acidic from the mulch that broke down over the last year. What were peachy colored hydrangeas last year are now bright blue! 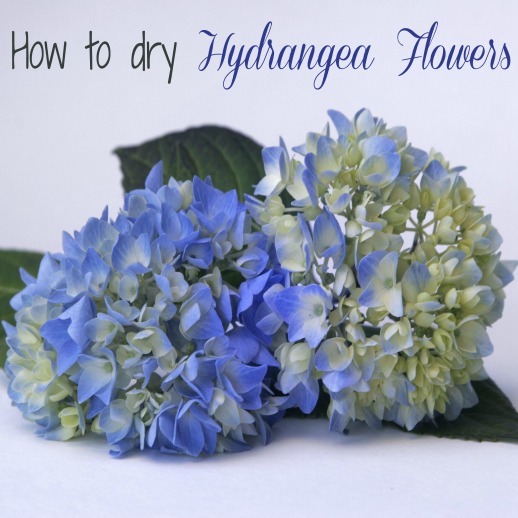 Did you know that it is very easy to water dry hydrangea flowers? Timing is important. Do not choose blooms that are at their peak…they have too much moisture in them. If you wait too long, they will turn brown. Put the hydrangeas in water. (necessary step. Drying without first putting them in water does not work well.) Be sure the stems are at least 1/2 covered in water. Move the vase to a cool spot, out of the direct sunlight. Go ahead and enjoy them for a while, since they will look attractive. Do not add water as it disappears. The only purpose of the water is to allow the hydrangeas to dry naturally. One the water is totally evaporated, the hydrangeas should feel dry to the touch. Another way to dry hydrangeas is to hang them upside down. Don’t tie them together. Because of their size, they are best dried individually. Note that air dried hydrangeas are more brittle than water dried ones. The color on dried hydrangeas will last about a year and then it will start to fade. 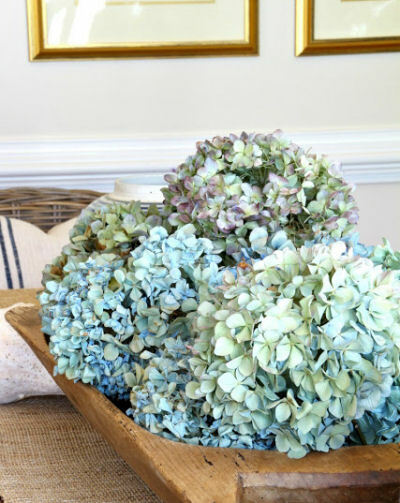 This image of dried hydrangeas is shared from Savvy Southern Style. Aren’t they lovely? Another use of the hydrangea flowers is to use them for a wreath. I did one for my front door and it came out beautifully. See the tutorial here. Have you ever tried to dry flowers? What were your results? 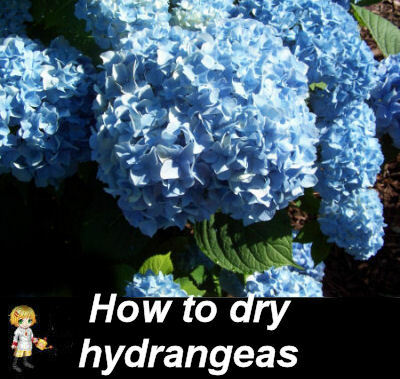 If this is something you like to do, be sure to check out my post on drying flowers with drying flowers with Borax. lovely hydrangeas ,my favorite.can’t wait to try water drying.